What? She made a salad? Oh yes, she sure did! Despite what some may think, I do enjoy a good salad. That said, I am not a weeds and lemon juice kind of gal (no offense to those of you who are). If you are going to feed me salad there are a few requirements that must be met (not that I am difficult to live with). First, it has to be hearty. 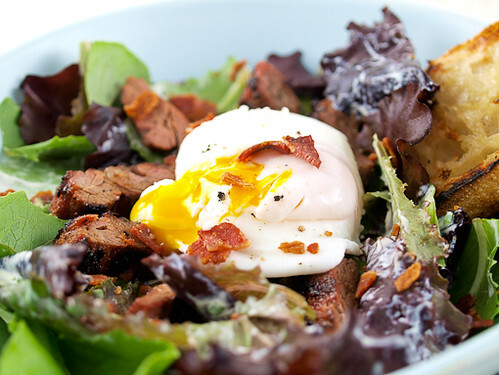 Steak, chicken, eggs, or even beans are a must on a salad because I need protein to keep me full. Second, it has to have a delicious dressing. I will be honest when I say that plain greens do nothing for me. I need dressing to keep my palate active and happy. Finally, and by no means least, the salad needs a fresh bread element. I will not even consider those sad croutons from the box. Give me crostini or grilled artisan bread with my salad to add some crunch. This salad makes a terrific meal during the warm summer months along with a frosty margarita or a cool glass of tea. 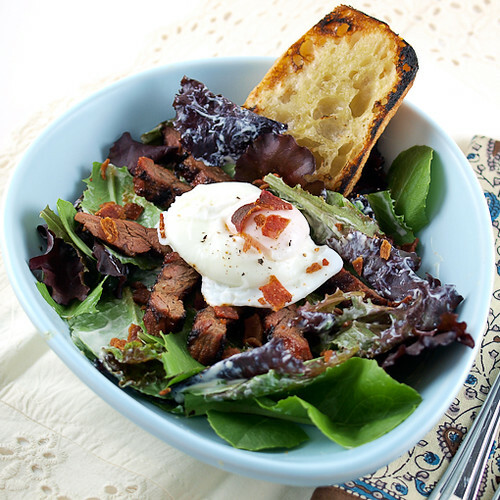 Despite the various components this salad can be made in under an hour from start to finish. You could even cut that time slightly by making the dressing and eggs a day ahead. 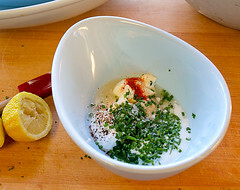 To make the eggs in advance just poach them for 1 1/2 minutes, or until the whites are just set, then slide the eggs into a bowl of ice water. Refrigerate the eggs overnight, then when you are ready to serve just slide the eggs into a bowl of hot, not boiling, water for 1 to 2 minutes. They will be nicely warmed and cooked perfectly, if you like a seriously runny yolk … which I do. Begin by preparing the dressing. In a medium bowl combine all the ingredients for the dressing and mix well. Cover and refrigerate for at least one hour, or up to one day ahead. Next, prepare the steak. In a small bowl combine the salt, pepper, brown sugar, mustard powder, and paprika until well mixed. 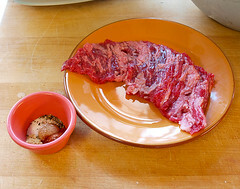 Rub the mixture into the steak and allow to stand, at room temperature, for 15 minutes. While the steak is marinating prepare the bread. 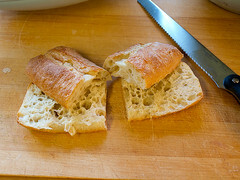 Split the ciabatta bread in half and then cut into 4 equal pieces. 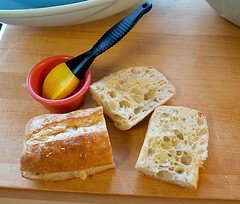 Brush the inside of the bread with olive oil. If desired season with salt. Grill the steak and the bread over medium high heat until the steak reaches your preferred level of doneness, and the bread is crisp and slightly charred. 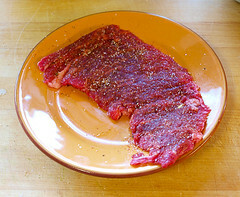 For a medium steak you are looking for an internal temperature of 135 to 140, about 2 minutes per side. Allow the steak to rest for 10 minutes loosely covered in foil, then slice the steak into thin strips against the grain of the meat. 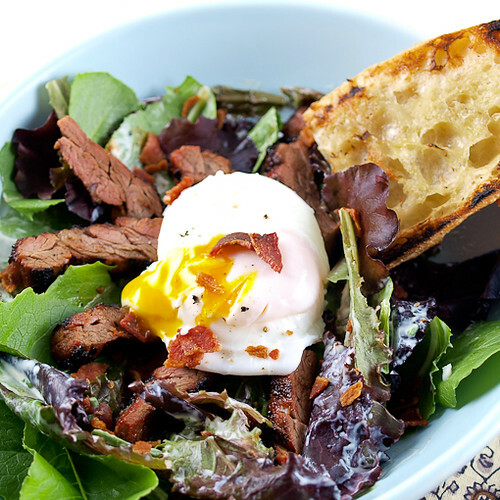 While the steak rests poach the eggs. Bring a wide pan filled 3-inches deep with water to a simmer over medium heat. Add the vinegar and stir to combine. Break the eggs, one at a time, into a small ramekin or dish. 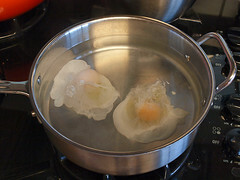 Slide the eggs slowly into the simmering water. Immediately turn the heat down to medium low and poach until the eggs are your preferred level of doneness. For a very runny yolk poach for 2 minutes, for a firmer yolk poach for 3 to 4 minutes. Remove the eggs from the water with a slotted spoon to drain, then slide the eggs onto a small plate while you dress the salad. To build the salad first toss the romain with half the dressing until evenly coated. Divide the salad among the plates. 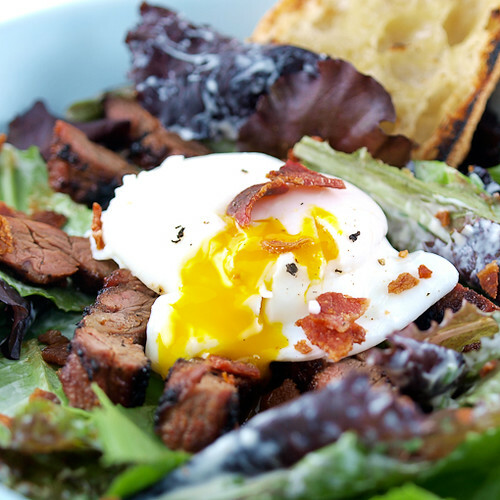 Add the steak, poached egg, crumbled bacon, and grilled bread. 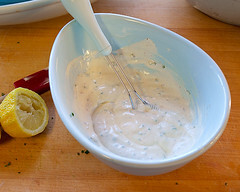 Serve immediately with the remaining dressing on the side for those who would like a little extra.